After bringing our first baby home from the hospital, I was in constant awe of how tiny and perfect his body was. He had the softest skin and hair, adorable toes and fingers, and perfectly shaped nails on each digit. However, it didn’t take much time before these adorable nails started growing out of control. Sometimes his nails would naturally peel off nicely, but he had a few of those vicious ones that just rip your chest to pieces. After my son scratched me (and his poor little face) a few times, I went online to find the best baby nail clippers, fast. I knew I needed something that was safe and easy to use. 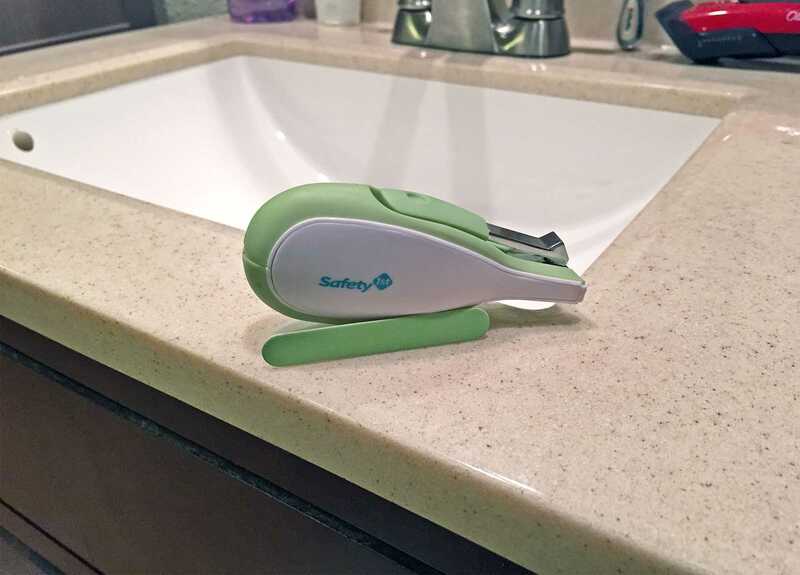 Luckily, the Safety 1st Sleepy Baby Nail Clipper came highly rated on Amazon, so we snagged one for home and one for the diaper bag. One of the main features that sold me is the large, soft touch handle. It makes the clippers incredibly easy to hold. Some smaller clippers, or those with a plastic handle, easily slip out of my hands making it much more difficult to safely trim his delicate nails. Let’s be realistic, a baby isn’t always going to be sleeping when you realize they need a trim. I’ll totally remember to cut his nails later, right? Forget it. It’s now or never sometimes. The extra grip on these is super helpful for that scenario. My only complaint is the front shape of the clippers. The LEDs actually curve outward from the steel making it more difficult to clip the corner of each nail. It takes a little more concentration to position the baby’s nail correctly, but it’s definitely the most manageable pair of clippers we tested overall. Our pick for the best baby nail clippers also comes with an emery board slot for easier filing. I haven’t tried to file my baby’s nails yet; they’re too soft, but it may come in handy once he’s older and has thicker nails. Toddler mani-pedis? Totes. The last thing I have to say comes directly from my husband. “The picture was orange and they sent us this lousy, pastel green.” Sorry, Josh. It doesn’t affect my decision to call them the best baby nail clippers. They could be pink, and I’d still use them. If you’re looking for more grooming products, Safety 1st also sells the Deluxe Healthcare and Grooming kit. It doesn’t come with our best baby nail clippers recommendation, but it’s still a good deal. The included clippers don’t have the LED lights, so you may want to pick up both items. Then you’ll be completely ready for whatever grooming needs your children face.